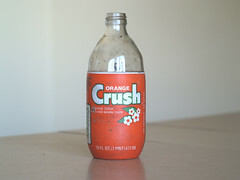 Orange Crush. On a walk down Bellevue Ave this sunny afternoon, I saw this Orange Crush bottle caked with mud and sitting in a flower box outside an apartment building. It feels a bit weird picking up something that seems like it can’t be that old, yet the graphic design is quite a few generations old. I’ve encountered this particular design before, at the Orange Crush laundromat, though I wouldn’t have guessed that design would have shown up on a bottle that seems so (relatively) recent. Such a bottle occupies a particular space in time — it’s a round 16oz glass bottle, with a styrofoam label, a UPC, and no Nutrition Facts or other nutrition info. I sort of know these bottles as ones I might have occasionally gotten as a kid — but by the time I was buying many sodas, they were in plastic bottles, save for Jolt, which kept the 16oz glass bottles a little longer. Before these chubby nonreturnable bottles, there were the returnable bottles with the pry-off tops. I vaguely remember a bottle vending machine at the ASCS office in Warren. While Orange Crush comes in 20oz/600ml plastic bottles like everything else now, it’s come full circle and is available in 12oz glass bottles with the other “speciality” sodas (along with some other revived brands like Bubble Up and Dad’s). I’m In Print! I was recently featured in the mnartists.org newsletter. That same feature will be partially reproduced in the mnartists quarterly arts supplement in The Rake, which hits the street April 30. There may be some more publicity coming in the near future, but I’ll hold off on that until I have a firm date for things. New Site. I’ve started a new site, using a name I’ve held for awhile, oddmart.com. I have a few notes on books: the How to Show Telephone Numbers On Letterheads booklet by Ladislav Sutnar and Asmara: Africa’s Secret Modernist City, as well as a couple that originally appeared this site. On oddmart I’ll also be selling some of the import-only graphic design books, as well as some reprints of out-of-copyright design books.